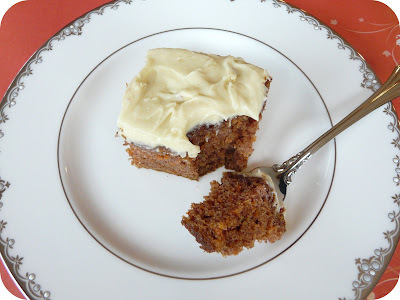 This is my favorite, tried and true Carrot Cake. I brought it to a Thanksgiving potluck and got many recipe requests, so I thought I'd share it here too. bake 40-50 minutes until center is cooked, check with a toothpick. cool in pan for at least 15 minutes. you can either flip it out or keep it in the original pan. 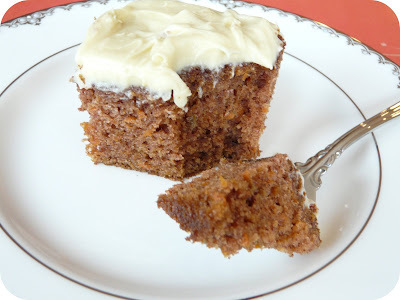 make frosting by mixing butter, cream cheese, sugar and vanilla. once cooled, frost the cake and serve. yummy! I'm still a little under-the-weather, but I need to drag myself to the grocery store tonight so I can pick up a BIRD. I have a feeling the pickings will be slim after this weekend!